Not everyone in the sport can be popular but the first FIA Formula 1 World Champion, Giuseppe Farina, was one of the least popular drivers of his day. Born into the famous Farina coach building family, he grew up wealthy and arrogant. He gained a doctorate in political science and after considering a military career decided to go racing in 1932. He proved himself to be extraordinarily brave but was also prone to accidents which meant that he was a regular visitor to hospitals throughout his career. The fact that he survived so many made him appear to be indestructible, in an era when drivers were often killed in accidents. Farina was also said to have been involved in accidents which claimed the lives of two rivals, rumours that were so strong that Enzo Ferrari specifically denied that Farina was dangerous in his 1983 book "Piloti, che gente..."
Rising quickly from the ranks of Italian amateurs Farina made his name in the 1930s with Maseratis and then competed in Scuderia Ferrari-entered Alfa Romeos in the 1938 and 1939 seasons. After the war Farina ran his own Maserati before being recalled to the Alfa Romeo factory team and, despite his advancing years, he became team leader after Jean-Pierre Wimille was killed at the start of 1949. 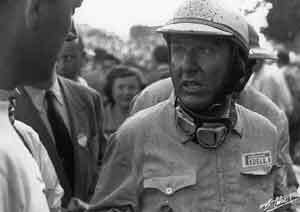 Farina won the World Championship in 1950 in dominant fashion but as competition increased in 1951 he was overshadowed by Juan-Manuel Fangio and moved to Ferrari. But there he found himself in the shadow of Alberto Ascari. He struggled on until the end of 1955 when he retired. There were several half-hearted comebacks, notably at Indianapolis. It is ironic that after years surviving big accidents Farina met his death on an Alpine road near between Geneva and Chambery while on his way to watch the 1966 French Grand Prix. He was 59.